Billie Jean Theide is an American artist known for creating sculptures and ornamental works in both metal and ceramics, which sometimes also incorporate found-objects or recycled materials. She is also an art professor at the University of Illinois at Urbana-Champaign, a curator of many exhibitions, and served as the President of the Society of North American Goldsmiths from 1995-1997. Many of Theide’s sculptures are intended to look like teapots. 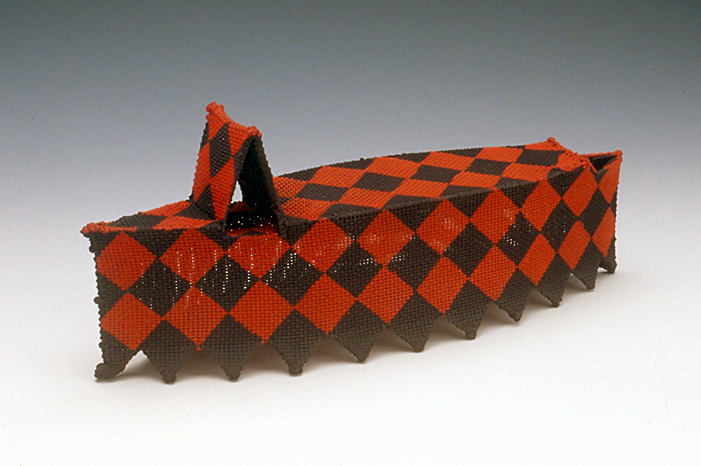 In a 2002 article in American Craft, Marjorie Simon quoted Theide as saying these vessels are “an autobiographical record or account of numerous visual experiences.” Some of the visual experiences Theide references in her work are recognizable elements from objects she collects, including Hall Teapots and antique flatirons. She also often alludes to architecture, geological features, and military equipment in her sculptures. I am at present preoccupied with displacing visual artifacts and images to influence perceptions and alter realities. Likenesses, representations, and copies are extracted and relocated into or onto paired surfaces for contemplation and reflection. I see beauty in the seemingly mundane. My creative practice is driven by a passion for history and collecting, an interest in hybridization, the absurd, and the human propensity for excess and ornamentation. Several of these themes can be seen in these two sculptures in the Kamm Collection. The earlier of these two, Butte #EF-9 (1998), is intended to represent a teapot, with a pouring spout and a protruding lid, but also resembles a flatiron, an ironclad warship, and the butte formations of the American west. The butte form, which Theide has used in several sculptures, is specifically a reference to the buttes that Theide has driven past many times while traveling between the Midwest and California. 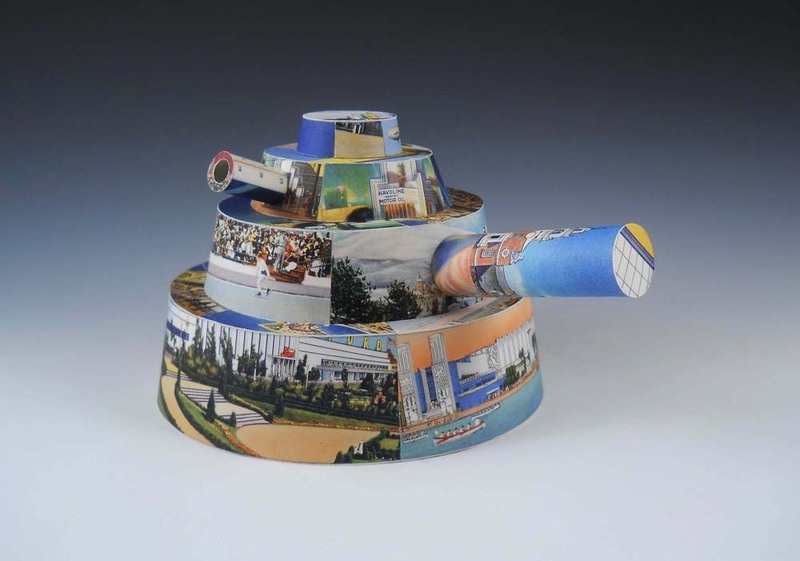 The more recent sculpture, C. T. Art-Colortone: Chicago World’s Fair (2015), is also in the form of a teapot, with a cylindrical spout and handle at perpendicular angles, and a removable lid. This sculpture also references the 1933-1934 Chicago World’s Fair, also called the “Century of Progress Exposition,” in several elements, including in the title and the vintage linen postcards from World’s Fair on the surface. The tiered form of the teapot body is also a reference to the Art Deco architecture of the 1933 World’s Fair. This hybrid sculpture includes elements of history, Theide’s own habits of collecting, and references to dramatic instances of ornamental architecture. While Theide’s choices of visual elements and their hybridization are personal and autobiographical, the manner in which she “displaces” or “relocates” visual artifacts and copies of other objects does prompt contemplation and reinterpretation of the meaning and ideas found in the work. For instance, the combination of a teapot and an ironclad warship in Butte #EF-9 brings to mind that both a teapot and an ironclad are tools that use boiling water, though one is for a specifically domestic purpose and the other is for violence. “Billie Jean Theide.” Society of North American Goldsmiths. “Billie Theide.” University of Illinois School of Art and Design. Simon, Marjorie. “Billie Jean Theide.” American Craft, vol. 61, 2002, pp. 64-67. Des Garenes, Christine. “Warm Welcome.” News Gazette, 24 Aug 2013, p. B1. Nora H. Weston is a reference librarian in a medical research facility and a former intern of the Kamm Teapot Foundation. She has also worked in museum and zoo education, hunger-relief outreach, and as an illustrator and visual artist.